Barely one in a hundred business people knows these facts about creating powerful advertising. Do You? FACT! Sixty percent of people read only headlines. Your headline must stop them or your advertising will likely fail. FACT! Captions under photos get 200 percent greater readership than non-headline copy. FACT! Ads with sale prices draw 20 percent more attention. FACT! Half-page ads pull about 70 percent of full-page ads; quarter-page ads pull about 50 percent of full-page ads. FACT! Four-colour ads are up to 45 percent more effective than black and white. FACT! New York's biggest ad agencies use dozens of these little-known secrets every day to influence people to buy. And now - thanks to CASHVERTISING - you can, too. And it won't matter one bit whether you're a corporate giant or an independent trader. These techniques are based on human psychology. They work no matter where you're located, no matter what kind of product or service you sell and no matter where you advertise. In fact, most don't cost a penny to use. 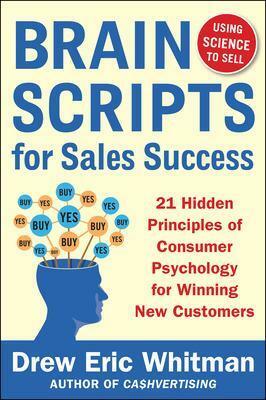 No matter what you sell - or how you sell it, this practical, fast-paced book will teach you: How to create powerful ads, brochures, sales letters, Websites, and more; How to make people believe what you say; "Sneaky" ways to persuade people to respond; Effective tricks for writing "magnetic" headlines; What mistakes to avoid...at all costs! ; What you should always/never do in your ads; Expert formulas, guidance, tips and strategies. 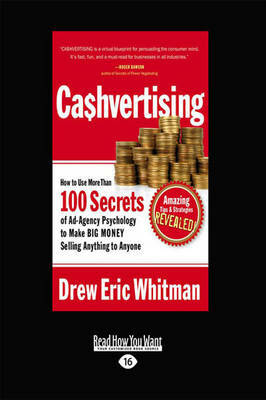 Buy Cashvertising by Drew Eric Whitman from Australia's Online Independent Bookstore, Boomerang Books. Drew Eric Whitman (a.k.a. "Dr. Direct" T) is known internationally as a dynamic consultant and trainer who smashes old advertising myths like a bull in china shop.